Tenerife is one of the world's best road cycling destinations. It's the largest of the Canary islands and, just off the African coast, offers a reliably warm climate year-around and fantastic climbing on smooth roads. The scenery is dramatic: from the lost world of Masca to vertical sea cliffs and the spectacular Mount Teide, Spain's highest mountain. You can see Teide from all over the island, looming upwards; it's one of the main attractions for the pro cycling teams that descend on the island during training camp season. There aren't many places you can train on 40+km climbs that take you from sea level to 2,300m during European winter. Cycling Tenerife is about as good as it gets. During Northern Hemisphere winter, Tenerife cycling training camps are abundant. But the island is also a major "sun and sand" holiday destination, with lots of hotels, water parks and beaches that make it a great choice if you're with family. Start with our video that gives you the best of Tenerife by bike. Then read on for our favourite Tenerife cycling routes and places to stay (including tips on where to go if you want to avoid the big all-inclusive package holiday resorts). By far the most famous ride on Tenerife is cycling up Mount Teide. The mountain dominates the island and if you're coming to Tenerife to cycle, it's unthinkable you'd leave without tackling it. There are five major routes up; our post will help you choose which to do - Cycling Mount Teide: which is the best Teide cycling route? Any one of these up and down routes of Teide could easily be a whole ride in itself: even the fittest amateurs will take at least 2.5 hours to climb to the top. But if you've got all day and want a truly special ride, check out our two Teide loops below. Yes, you've got to ride Teide. But there are some other awesome Tenerife bike routes too. To really experience the island, ride the road to Masca where craggy Andes-style mountains are dotted with rustic Spanish villages before they plunge into the turquoise sea. The scenery is epic - but so are the gradients. This is one tough ride. From Masca it's not far to the unforgettable Teno lighthouse. The road clings to the cliff and offers draw-dropping Atlantic views before bringing you to the spectacular lighthouse at the end of the peninsula. If you hate climbing, don't come to Tenerife. Most of the roads either go up or down, there's very little flat. What there is is not that exciting. But while most of the roads go up or down, at least the main roads (like those up Teide) are generally at decent gradients (just avoid some of the extremely steep side roads). This makes them accessible even if you're only moderately fit. Cycling in Tenerife is more about endurance than extreme fitness: you don't need to be a Contador or Quintana, you "just" need to be able to keep going for kilometre after kilometre! A loop around La Orotava via Palo Blanco, Benijos and La Perdoma, along the TF-326, TF-21 and TF-324: around 24km with 700m of climbing. Granadilla de Abona to Arafo along the TF-28 and TF-525: roughly 54km and 1,000m of climbing each way. Our Teide via Vilaflor loop includes this section. La Orotava to Tejina on the northwest coast, along the TF-21, TF-217, TF-1224 and TF-16: around 32km with 600m of climbing. The hotels listed below allow guests to either store their bikes in their room or keep them in bike storage facilities (though you should check that these policies haven’t changed when you book). If you're deciding where's best to stay in Tenerife for cyclists, start with our in-depth article on the pros and cons of each resort: Best places to stay in Tenerife (for cyclists). We spent five nights at Be Live, Playa La Arena. 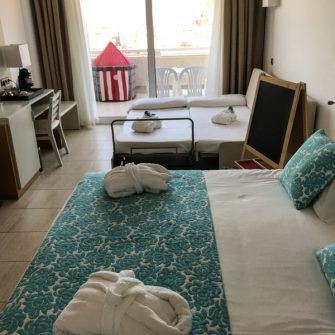 It's a large hotel with lots of facilities and it's a good option if you're travelling with children and/or looking for an all-inclusive package. Good location on the west coast, giving access from the door to Teide (via Chio) and also to Masca in the northwest. Large, attractive pool area with three pools surrounded by palm trees, facing the sea. The main pool is in the middle and pool activities are run here (for example water aerobics). The pool closest to the sea does not permit the use of inflatables and so is quieter and has an adult focus. The small children's pool is furthest from the sea. It is divided into two with half being the drop off zone for the water slide and the other half the shallow pool for toddlers. Our 4 year old loved the waterslide and spent at least an hour just taking himself up and down it. Kid-friendly activities in addition to the pool area. The kids club (open 11-12:45 and 3-5, children under 6 have to be accompanied by an adult) is based next to an excellent pirate ship climbing frame. The same area also hosts mini golf, archery, a pétanque court, balance beams course and tennis court. Near the pools there is also table tennis. Gym and spa. There is also a program of daytime and evening activities, should you wish to participate. Lift access from the hotel down to the black sand beach of Playa La Arena. Wide range of food available at each meal and each night has a different theme. A limited range of food is cooked to order (for example eggs or omelettes for breakfast). Our superior family room on the 6th floor contained a king sized bed and sofa bed for the children. It was sufficiently spacious for the four of us though the cupboard space was limited (we'd definitely recommend using packing cases so you don't have to fully unpack). The children enjoyed the blackboard, floor puzzle and play tent in the room, as well as the kids bathroom accessories. We enjoyed the views from our room across Playa La Arena to the cliffs of Los Gigantes. The hotel is used by a number of British, German and French holiday operators. This is no small boutique hotel. We would suggest the hotel is more 3 star than 4 star. It's comfortable, with good facilities, but don't expect it to be overly smart. The hotel charges for extras you might normally expect to be included. For example, use of the safe deposit box in each room and use of the hotel car park. A 12 euro deposit is also payable for each pool towel. Food is served 7:30-10:30, 13:00-15:00 and 18:30-21:30 in the main restaurant. Outside of those times, food is available in the snack bar but the choice is much more limited that the main restaurant and we didn't find it very appetising. We enjoyed our stay here. Our 2 and 4 year old kids loved the facilities and we liked the location. Want to know more about Playa La Arena? Read our post on Tenerife's different resorts. Looking for something more luxurious but also around the Playa La Arena area? Check out the five star Gran Melia Palacio de Isora. 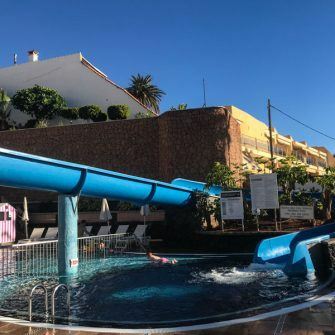 It's just south of Playa La Arena and is an indulgent, slick hotel with superb facilities for families including play area, kids' pool, mini club (3-12 year olds) and live show for children. It was voted Best Resort in Spain by Condé Nast Traveler in 2012 and 2014. The hotel confirmed that they have a cloakroom for bike storage which can only be opened by the Concierge team. 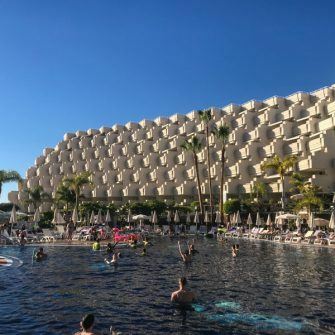 Want to know what Costa Adeje is like? Read our post on Tenerife's different resorts. If you're looking for a peaceful, five star luxury experience (and you're not with kids), look no further. The Royal Garden Villas Hotel comprises 28 individual luxury villas, each with their own pool. Asian themed spa with jacuzzi, waterfall, waterbeds, Turkish bath, hydro massage showers and ice fountain. Tranquil atmosphere and attentive service. Restaurants in La Caleta are a 20 minute walk. Tip: we asked the hotel whether we could store a road bike in our bedroom and they confirmed that was no problem. Hotel Riu Palace is a four star hotel with excellent service and good food in a quiet, seafront location. Located on the seafront promenade with a short walk to Caleta in one direction and Adeje in the other. Infinity pool, two swimming pools, children's pool, children's playground. Tip: the hotel confirmed we could keep our bike in our room or in the luggage room. One of the main attractions of staying at the three star Hovima Jardin Caleta is that it is next door to Tenerife's Top Training facility. The hotel comprises one or two bedroom apartments each with living room, kitchen, bathroom and balcony. Close to the Playa del Duque and La Enramada beaches. Kids pool and main pool (heated November to March) plus rooftop jacuzzi. Tip: the hotel confirmed it was possible for guests to store road bikes in their room. Hotel Tigaiga is a family-run hotel where friendly service is a feature. It is located on a hill in the Taoro Park with views of the Orotava Valley and Mount Teide. The hotel is surrounded by subtropical gardens. Heated outdoor swimming pool, plus table tennis and giant chess. Walk into Puerto de la Cruz in 15-20 minutes. The hotel also has some apartments. Tip: on enquiring about storage of road bikes, we were told they have a garage where bikes can be stored safely. Hotel Riu Garoe is a three star hotel where guests are very positive about customer service and many make return visits. Lots of facilities including outdoor pool, indoor pool, jacuzzi, solarium terrace, sauna, tennis court, squash, mini gold and table tennis. 2km to the Lago Martianez saltwater pools in Puerto de la Cruz, or there is a shuttle bus. Tip: the hotel confirmed that guests are allowed to bring their bikes into the room. Tastefully decorated three star apartments designed for three to five people. One or two bedroom apartments complete with American kitchen and balcony or terrace. Set around a courtyard garden with palm trees and green lawns. There's a pool too. Within walking distance of the botanic gardens with Playa Martianez beach 2km away and the town centre 2.5 km. Tip: the hotel allows guests to put bikes on the terrace or balcony of their apartment. La Laguna Gran Hotel is a four star hotel housed in an old tobacco factory close to the centre of the historic town. 22 metre long roof top pool with mountain and city views. Michelin starred restaurant (one of only five on Tenerife). Elegantly decorated in a contemporary style. Tip: the hotel has a luggage room where bikes can be stored. We were told that this is located next to reception, is always locked and receptionists accompany the clients to leave/pick up luggage from the room. The Parador is a mountain lodge in a dramatic location, being the only building in the Mount Teide Nature Reserve. This is where the pros come to sleep at altitude before testing themselves on the slopes of Mount Teide. It's a hotel with serious cycling pedigree. The terrace has stunning views over the Roques de Garcia rock formations. Rooms are traditional with dark wood and old fashioned bedsteads. Tip: the hotel has a luggage room where bikes can be stored. We were told that this is located next to reception and is locked. An adult only hotel located on the tip of a spectacular bay and orientated towards the sea. Thalasso therapy spa (including thermal circuit, sauna and jacuzzi). Various activities including gym, table tennis, darts and a games room. Outdoor pool area directly above the sea, with far-reaching views. Tip: the hotel allows guests to either keep their bike in their room or in a room next to the reception desk. We were told that this is always locked and that they keep the key in reception. Looking for road bike rental in Tenerife? Below you'll find all the road bike hire shops we've been able to uncover on Tenerife. Missed one? Please let us know! We haven't used these ourselves but would love to hear your experiences. Please drop us a line! You'll soon see that most of the cycle hire in Tenerife is clustered where most of the tourists are: in the southwest. If you're staying somewhere else, don't despair, some of the bike rental shops will deliver bikes across the island. We've made a note of where they offer this. Most of the rental shops also offer Tenerife cycling tours and excursions, from half days to multi day cycle training camps. Wilier bikes. The Montegrappa aluminium bikes have Shimano Tiaga compact cranks and 12/28 cassettes. The Wilier GTR carbon bikes have Ultegra compact cranks with 11/28 cassettes. BH, Cannondale, Specialized and Pinarello bikes with compact cranks and 11-28 or 11-32 cassettes. Mostly Ultegra. Disc brakes available. Felt and Specialized bikes have aluminium frames, Look and Stevens have carbon frames. Ultegra or 105. Compact cranks, 11-28 or 11-32 cassettes. Stevens bike has disc brakes. Prices vary depending on model and number of days. From 16-25 euros per day. Wide range of BMC, Ridley and Focus bikes. Mostly carbon bikes. Disc brakes available. Included: pump, spare inner tube, levers and a multi-tool set. Prices vary depending on model and number of days. From 14-44 euros per day. Merida Scultura 400 aluminium bikes and Merida Scultura 4000 carbon bikes each with full ultegra and a 11/32 cassette. Included: pedals, replacement tubing, tire iron, tools and lock. Stages powermeter: 2 Euros per day + 20 Euro deposit. 50 Euro deposit per bike. Identity card required. Limited number of Ridley, Orbea, Scott, BH and Kuota bikes. Prices vary depending on model and number of days. From 20-27 euros per day. Kuota carbon bikes with Shimpano 105 or Ultegra. Included: mini tool kit, inner tube, mini pump, two bottle cages. Will deliver anywhere in the Tenerife south area. Prices vary depending on model and number of days. From 24 Euros per day. Pinarello, Wilier and BMC bikes available. Prices vary depending on model and number of days. From 16 Euros per day. Ridley and BMC carbon bikes. Prices vary depending on model and number of days. From 19 Euros per day. More of a tour company specialist than a bike hire specialist. BMC and Focus carbon bikes available. Prices are given for 6 day blocks only and range from 160 - 220 Euros. Book your bike in advance, particularly in peak season. Shops sometimes close, move or change their prices/bikes before we have a chance to update this list, so please contact them directly before you visit. Remember to bring your own pedals, shoes and helmet. This packing list may help! Check which way around your brakes are set before you ride away (i.e. whether the front brakes are on the right hand (as is usual in the UK) or on the left (as is usual elsewhere in Europe)). Also take a look at our list of things to check before hiring a bike. 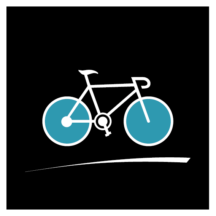 Undecided on whether to hire a bike or bring your own? Read this now. Average temperatures in Tenerife remain a good 17-24 throughout the year, making it a good choice for anyone looking to cycle in the sun. Rainfall is also low - you're most likely to get rain in December and even then it's only on average for 6 days of the month. Throughout the year it's worth remembering that the North side of the island is often cooler and wetter than the South. There's a reason the scenery in the North is greener than the arid rocky South! The upper part of the island is often shrouded in a thin layer of clouds that forms around Mount Teide at 1,000-1,500htm. Temperatures on Tenerife remain good for cycling throughout the Northern Hemisphere winter. At sea level, short sleeve jerseys and bib shorts should be fine. However, you may get some rain and in the mountains temperatures can be much colder than at sea level. Frost and ice above 2,000m is possible. Dress accordingly. Temperatures increase a little and the risk of rain reduces. On most days, the temperature at midday is similar in the mountains as at sea level, assuming it's not too cloudy in the mountains. It's still wortth packing a windproof jacket and arm warmers. You can expect warm days and a low risk of rain during this period. Sometimes it can be warmer in the mountains than at sea level. It's still worth bringing a windproof jacket if you're planning on mountain descents: they are long and the windchill can be surprising. September remains very warm with barely any risk of rain but as October rolls in, that risk increases. As in April and May, temperatures are often similar in the mountains as at sea level but pack a jacket and arm warmers in case. See comments for January to March. Rainfall in November and December is a bit higher than January to March, with averages at 47 and 56 mm and 5 and 6 days respectively. Marco Polo guide to Tenerife: the book gives an overview of the main destinations on the island and we liked the introductory chapters on the island and its food and drink. It comes with a separate map at 1:130,000 which was useful for high level planning but lacking sufficient detail to show all the minor roads. The Real Tenerife by Andrea and Jack Montgomery puts a bit more flesh on the bones. It's a personal guide to Tenerife and more opinionated than the Marco Polo guide. The enthusiastic authors help you get under the island's skin, but we did find that some of their descriptions were a little over-romantic. Also the photos are black and white, there is no index and the map is poor. Nonetheless, a refreshing change to your typical guidebook. If you like physical maps for route planning, it's worth buying the Globe series map of Tenerife. At 1:75,000 it shows all the roads relevant to cyclists. It is annotated with symbols for things like gas stations and tourist destinations which you may either like or not. Tenerife has two airports, one in the south in the municipality of Granadilla de Abona (this is the larger of the two) and the other in the north in San Cristóbal de La Laguna. Decide where you want to base yourself before booking your flights! Before you set out on your bike, don't miss our article, top tips for cycling Tenerife. It's full of practical ideas to help make your cycling in Tenerife as good an experience as possible. Did you enjoy our guide to Tenerife? Let us know in the comments below! Want to check out some other destinations in Spain or elsewhere? Search by the month you want to travel or cycling destination you want to visit, here. Or check out our other articles on Tenerife, below. Read this for our firsthand, cyclist's perspective on the best areas to stay in Tenerife for road cycling. We consider the best rides, bike hire shops as well as hotels, beaches and things to do. This tough loop of Masca and the Teno lighthouse is one of our favourite rides in Tenerife. You'll cycle through the stunning Masca gorge and to the unforgettable Teno lighthouse. Our top tips for ensuring you have a fantastic Tenerife cycling holiday. Discover this mind-blowing landscape of deep ravines, lush laurel forest and traditional villages. Our guide gives you the best route to uncover this off-the-beaten-track gem. Our 140 km loop turns cycling Mount Teide into an unforgettable loop up and over the volcano and through Eastern Tenerife. This guide tells you everything you need to do it. This 135km loop takes in the quiet north of Tenerife, the pretty town of La Orotava and the beauful 45km climb to Teide's crater. Read on for everything you need to know if you're planning a trip.